Tooth whitening is a cosmetic dental treatment used to brighten the natural colour of your teeth. Over the years the natural whiteness of your teeth can become stained by tobacco foods and certain drinks such as coffee, tea and red wine. Tooth whitening is an effective treatment that will bring back the brightness of your teeth in a short space of time. Certain tooth conditions do exist that will mean tooth whitening will not be a viable option. If you have teeth with white fillings, or bonding on your teeth, then the whitening process will not make any difference. You also cannot whiten any type of dentures or bridgework. The darker the teeth the less effective the whitening process will be, but people with yellowish or stained teeth should notice a big difference. Your dentist will be able to give advice on the best options and may suggest veneers if the whitening process is not a viable option. Tooth whitening by your dentist will usually be achieved by bleaching the teeth. The solution used will contain either hydrogen or carbamide peroxide, which will break down on the tooth and allow oxygen into the enamel. This then bleaches the teeth and achieves the desired whitening effect. 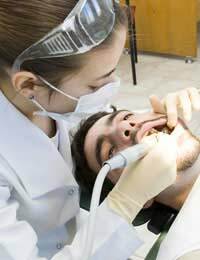 The dentist will first place a protective covering over the gums; usually a rubber guard or some form of gel. He will then apply the bleaching agent to the teeth using a tray specifically designed to fit your own teeth. The tooth whitening treatment will usually take around two or three visits to complete and the whole process should last no longer than a month. The dental visits will also be combined with an at home whitening process. You will need to regularly apply the bleaching agent at home for around 30 minutes for a period of at least two to four weeks. Your dentist will advise you of the exact frequency of application. Laser, or power whitening, is another professional procedure that can leave teeth up to six shades whiter. The process involves using a light or laser to activate a bleaching agent that has been placed on your teeth. Laser whitening is far quicker than traditional bleaching methods, and the procedure will usually only take around an hour to complete. You can have as many teeth as you like whitened, whether it a full set or individual teeth. Teeth that appear dark after root canal treatment can achieve a whiter appearance by applying the agent to the inside of the tooth. If you do not smoke or consume a lot of stain causing food or drink, then your bright smile should last for around three years. This estimated timescale will vary from individual to individual, and on the tooth whitening process used. There has been a lot of speculation regarding the effectiveness of home whitening kits. Many of these kits do not contain enough of the bleaching agents to significantly achieve the desired whiteness. There have also been findings that some of the kits have gone above the recommended level of bleaching agent, or contain abrasive elements; this can have a serious detrimental effect on the enamel of the teeth. For the best results, the tooth whitening procedure should only be performed by a professional. There are a number of toothpastes available that are specifically designed to whiten the teeth. Although these toothpastes cannot improve on the natural colour of your teeth they may be able to help eliminate stains. Once the teeth have been whitened, there are only a few rules to stick by that will keep them in good condition. Daily brushing and flossing, and limiting the amount of sugary snacks and drinks that can stain the teeth is recommended. If you smoke then this can seriously stain the teeth, not to mention increase the chances of tooth infection. If performed by a professional, tooth whitening can show a marked difference to the colour of your teeth. The teeth will be significantly brighter, and previously stained or discoloured teeth will now blend with the natural colour of the adjacent teeth. Tooth whitening has become a very popular treatment to enhance the teeth without the need for surgery. There are some great Home Tooth Whitening Kits like you said. I have treid a couple of them and must say they work pretty decent.